With the first ever Global Recycling Day around the corner on 18 March 2018, Montecasino is heeding the call to improve waste management and increase the ratio of waste that is recycled or reused – with a new food waste system and efforts to raise awareness of the need to recycle and the availability of recycling facilities among visitors, staff, and the local community. Montecasino is in the process of installing a new food waste system to service the staff dining room, where approximately 1 500 meals are produced daily. The dual-chamber system, is a Joraform Bio-container, imported from Sweden, creates compost from food waste in two-week cycles. Food waste is deposited into the hopper and ground up before being ejected into the first chamber, where it is aerated and mixed with incoming fresh waste and wood pellets. After two weeks, it passes into the second chamber where it is isolated, constantly agitated, and the maturation process is completed. 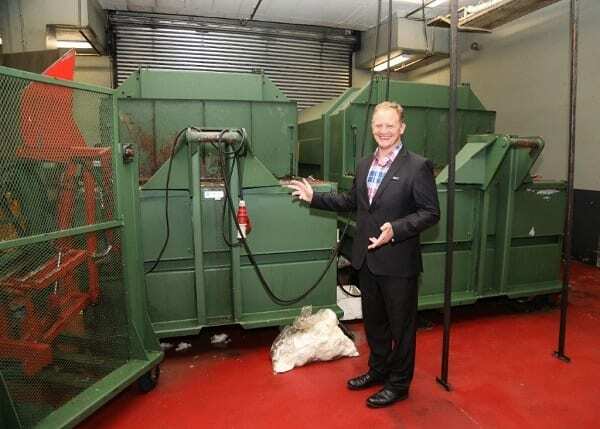 It has the capacity to process up to 4 000 litres of cooked food waste per month, and, says Page, it will pay for itself within a year with the compost that will be used in the extensive Montecasino gardens. Another new initiative, ‘The Last Straw’, introduced at the suggestion of 10-year-old Harriet Dawes from the 1st Fourways Cubs Pack, aims to eliminate the use of plastic straws due to the lasting damage they do, particularly to ocean life. Beverage-serving tenants on the property are encouraged to consider using alternatives to plastic straws. Ocean Basket has taken this a step further and is no longer providing plastic straws or plastic bags to their customers in any of their restaurants. 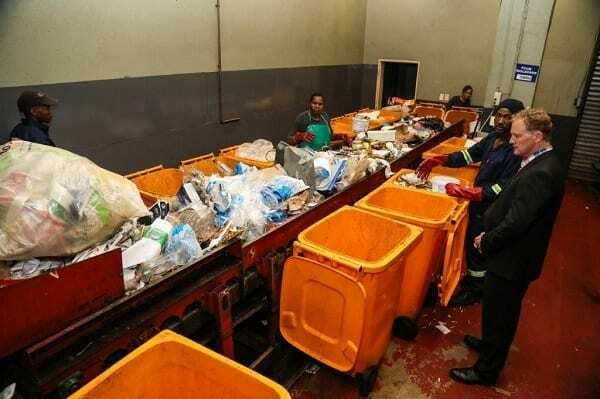 Montecasino’s waste management is outsourced to Interwaste, which manages a large, highly efficient and pristine waste area on site that was extensively upgraded about three years ago. All waste is sorted and separated, compacted, and transported to various depots for recycling, and to landfills. Special waste such as fluorescent tubes are collected by accredited specialist recycling companies and each component is recycled separately. As a community service, Montecasino has public recycling facilities adjacent to the Pivot that are available to customers and staff, for glass, cardboard and paper, tins, and e-waste such as batteries or globes, which all feed into Montecasino’s waste stream. Within the precinct, including the Montecasino Bird Gardens and the three hotels, each of the 40 restaurants and food court outlets has three Otto bins for food waste, dry waste, and for contaminated waste that cannot be recycled. The back of house operations in the food service businesses are monitored by Interwaste staff, who are quick to pick up mishandling of waste, according to the property’s environmental code of conduct. At this stage, Montecasino is recycling between 35% and 40% of its total waste, with a constant focus on increasing this level. “Every sub-contractor and tenant operating on Montecasino’s premises is given our environmental policies and is expected to comply fully,” says Page, adding that the in-house and Interwaste waste management team is constantly on the alert for any potential waste that can be recycled, such as plastic piping that might have been replaced, and any other waste. Interwaste conducts recycling training with new tenants and refresher training with existing tenants to ensure consistency and efficiency in waste recycling. “Our waste management initiatives are crucial to our efforts to increase recycling, but possibly a bigger challenge is encouraging every person on the property – tenants, staff and visitors – to understand the need to reduce waste and to have a recycling and reusing mindset about everything they use,” says Page. For more information go to www.tsogosun.com/montecasino, join us on Facebook at facebook.com/montecasino or follow us on Twitter at @MontecasinoZA. 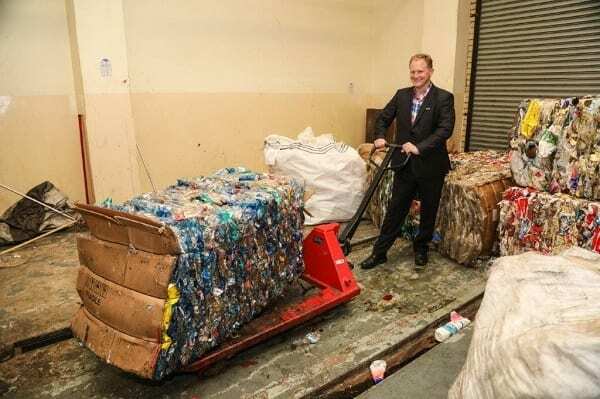 Photos: Mike Page, Director of Operations and Complex General Manager, in the Montecasino Recycling Plant.